I am a huge fan of mobile devices. I was one of the first people to use a Casio Zoomer back in 1992 and moved on to Palm devices in 1998. I recently made the Great Conversion to a Blackjack smartphone and upgraded to a Blackjack II last November. I love seeing what new things you can do on these devices, and am always willing to try new tools and applications on my phone. But there is a limit. Some things were not meant to be done on a phone. The fundamental problem with phones is that the display can only convey so much information. As tools get more and more sophisticated, it seems that the designers are trying to display more and more information on the display. Microsoft seems intent on running the entire Office suite on my smartphone, and phone browsers struggle to handle the complex content of full web pages. I finally realized why this is happening. The people designing and building these tools have 25-year-old eyes. Many of the people using these tools have eyes that are… much older. Tiny little sharp letters and itty-bitty icons work great for young users. They are completely wasted on us more mature technophiles. 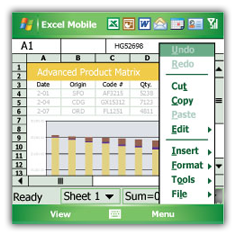 Have you ever tried to use Mobile Excel? Somehow, being able to see five or six cells of a spreadsheet at once leaves a bit to be desired from a usability perspective. Even as tools get more sophisticated in their rendering capabilities (the latest crop of zooming browsers is very cool), there is still only so much you can see at once on the screen. Even when I zoom out until I can just barely read the text on the screen, I still find myself panning back and forth just to read a single text flow in a document. Attempts to reflow the document often break the layout and make the document difficult to understand. This is all the result of what I call “Mount Everest development.” Many tools are ported to mobile platforms just “because it is there.” It may be clever and a testimony to someone’s development skills, but it is ultimately useless. When IBM PCs first became popular, one of the most important things you could buy was an Irma board. It added the coax connector and software that let your PC emulate a 3270 terminal. Migrating a 3270 mainframe display onto this new platform was useful, but hardly scratched the surface of what the device could really do. The real breakthrough on these devices occurs when clever ways to exploit the form-factor emerge. Instead of dragging the tools of the past onto the platforms of the future, we need to figure out how to use these platforms in ways we never previously imagined.